Shown above, Sharp's custom chinks shown in deertan cowhide. Strong, durable and water resistant leather that is butter soft. 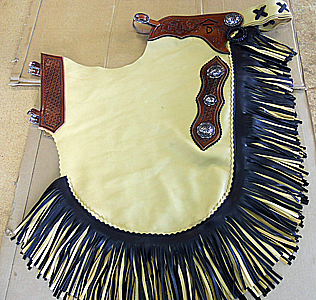 Yoke and side panel is chestnut USA leather stamped and tooled to match customer saddle. Custom brand hand painted in yoke. Twisted fringe makes for a classy fun look. Special order only. Please call for pricing. Shown above, Sharp's custom chinks in deertan cowhide. Strong, durable and water resistant leather that is butter soft. 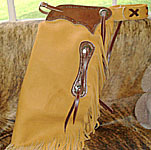 Yoke and side panel is chestnut USA leather stamped and tooled to match customer saddle. Custom brand is hand painted in yoke. 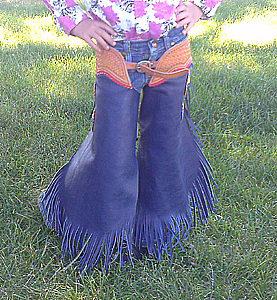 Double layer fringe in black to match concho accents and black leather accents under yoke and side piece. Special order only. Please call for pricing. 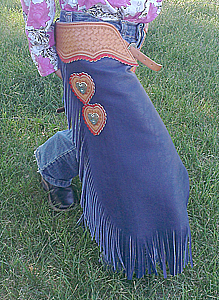 Rodeo princess chinks shown above in blue USA leather with red accents, conchos are hearts with crystals. Special order only. Please call for pricing. "If you don't see it we can build it!" Sharp's Saddlery is a FULL SERVICE shop offering saddle and tack repairs.